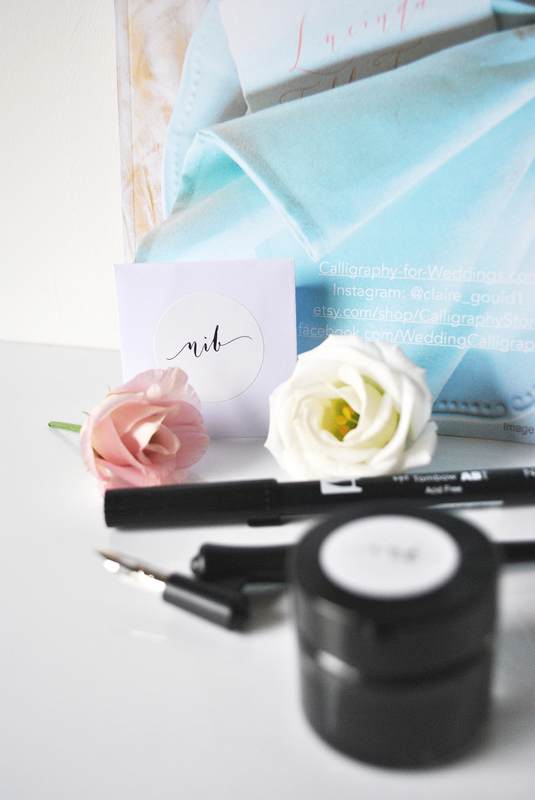 Latest projects, ponderings and calligraphy news! 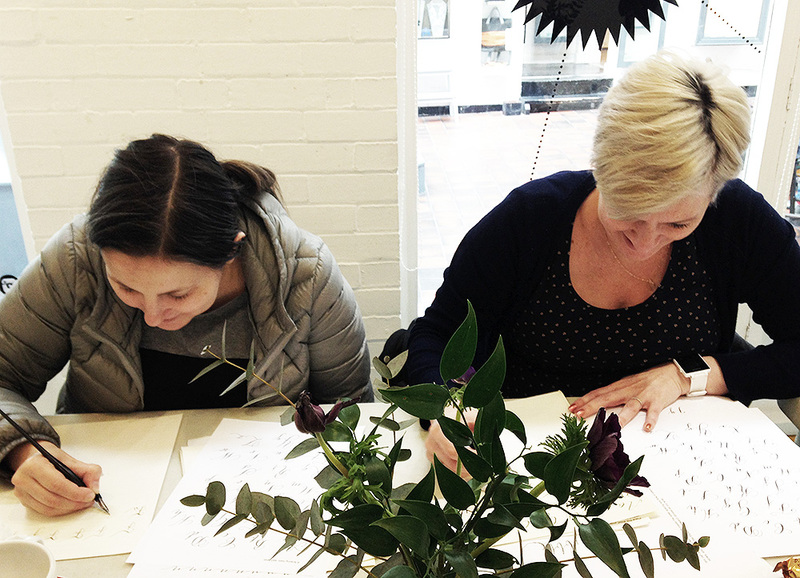 February was fantastic – with one of the best calligraphy workshops yet and a lovely bunch of students in Manchester’s Northern Quarter. I always take a few pictures of the day to remember it by… and looking back this time I really loved some of the progress everyone made on the day. 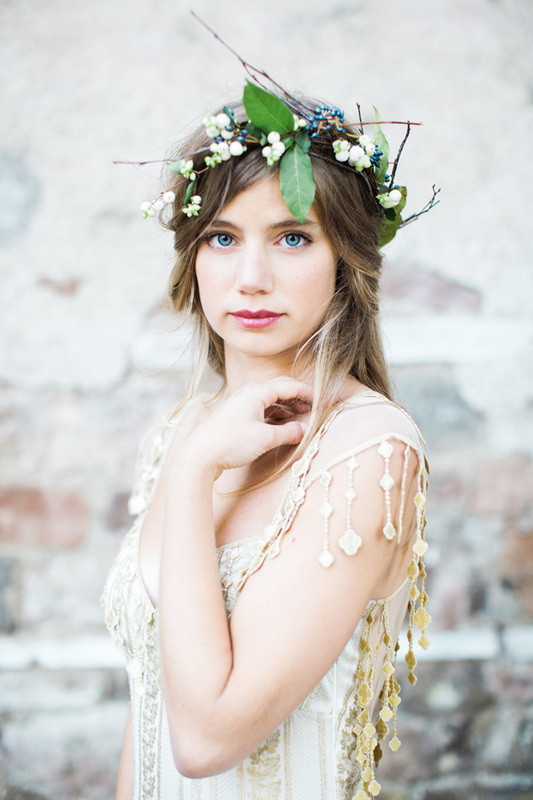 So if you’d care for a peek at what happens in the workshops, scroll through the images and enjoy! 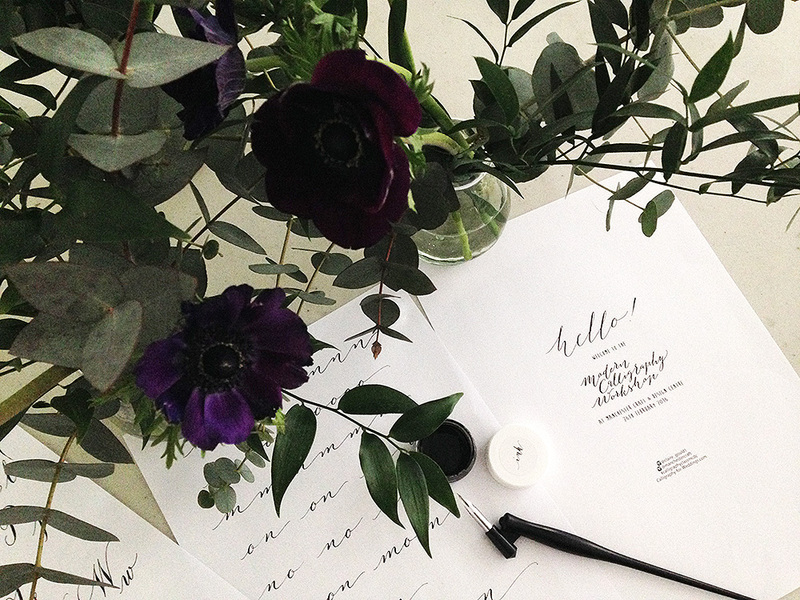 There are still places available on my March calligraphy workshop where we’ll be focusing on gorgeous brush lettering and I would LOVE to see you there. 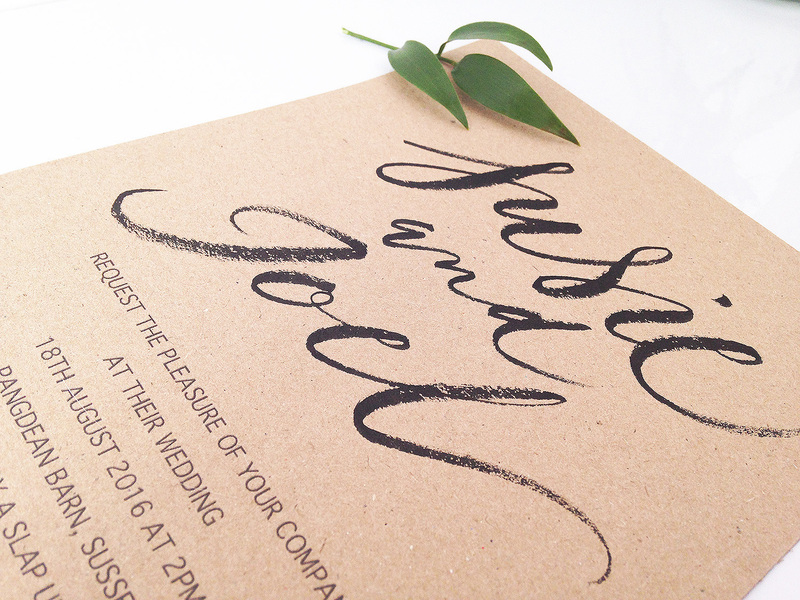 You can book online at Etsy.com/CalligraphyStore or contact me directly at hello@calligraphy-for-weddings.com to book your place. Everyone was a star on the day – by the end of the session I was fascinated by everyone’s lettering and really impressed with the progress all of the girls had made in just a few hours. 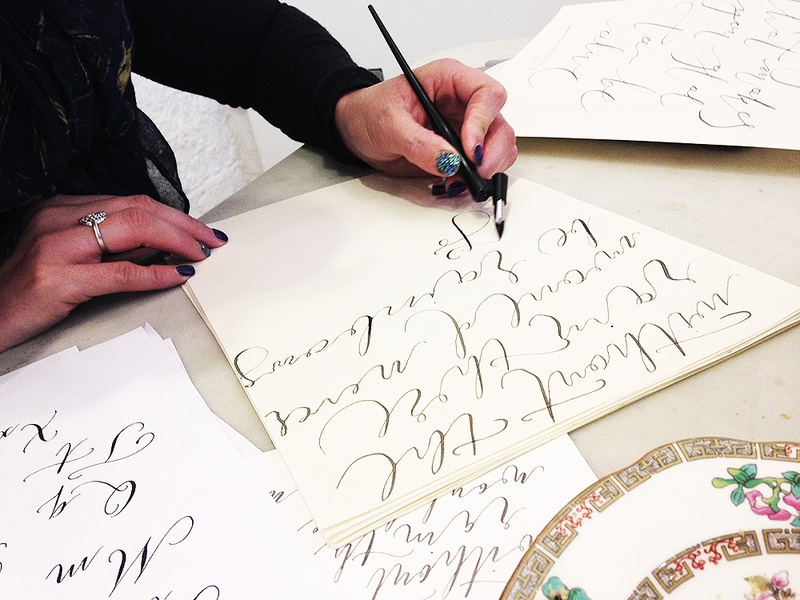 If you’d like to try your hand at calligraphy please join us on Friday the 18th of March for another Manchester workshop. All of your pens and paper will be provided along with alphabets, examples and practice sheets – and you get to take everything home with you to keep practicing! 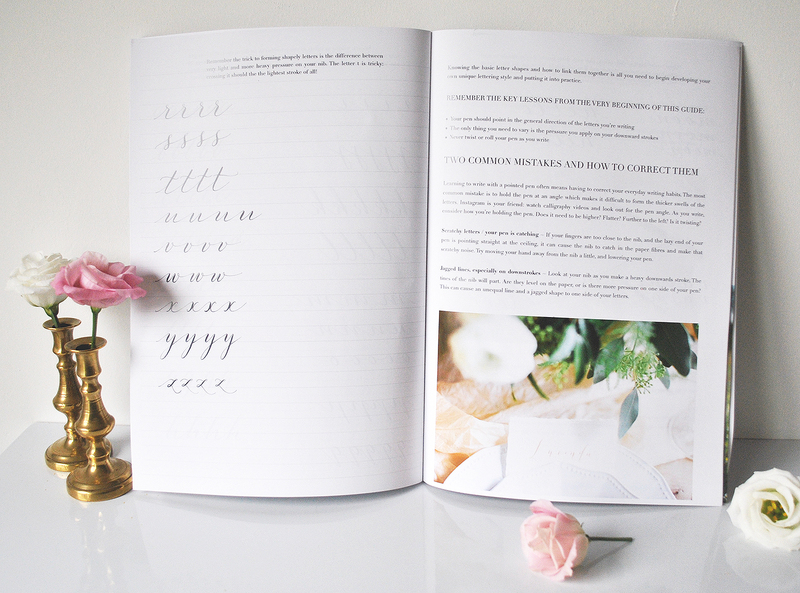 Book online: Etsy.com/CalligraphyStore or email hello@calligraphy-for-weddings.com to book your place. 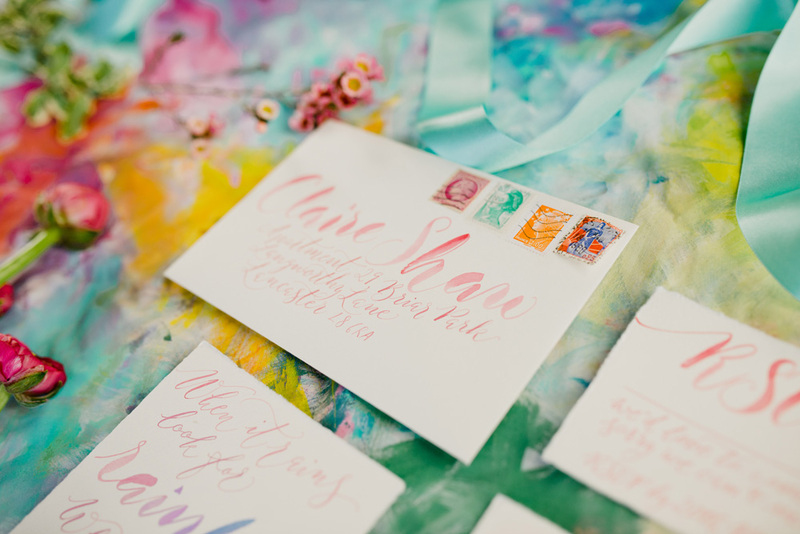 Brush lettering calligraphy and a colourful and alternative wedding suite! 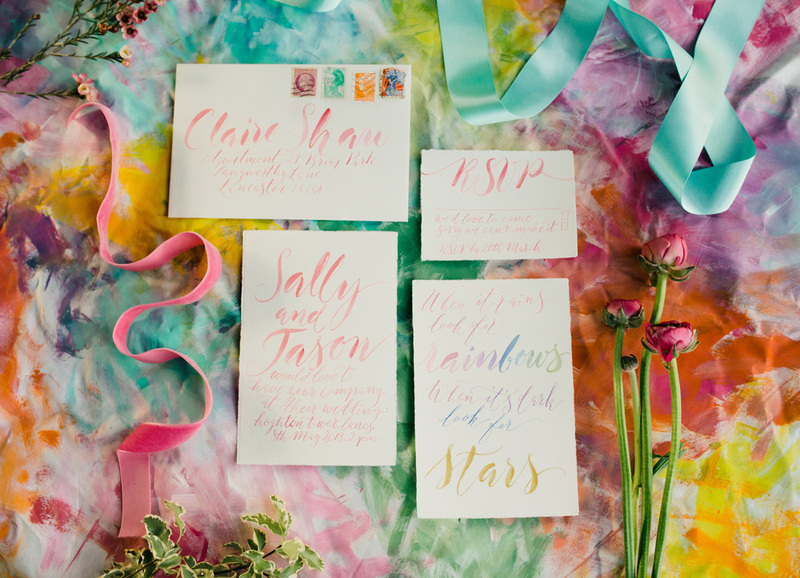 Subtle, pastel, barely there calligraphy and type has been a huge wedding trend and looks set to continue well into 2016… but there are always couples looking for something different. 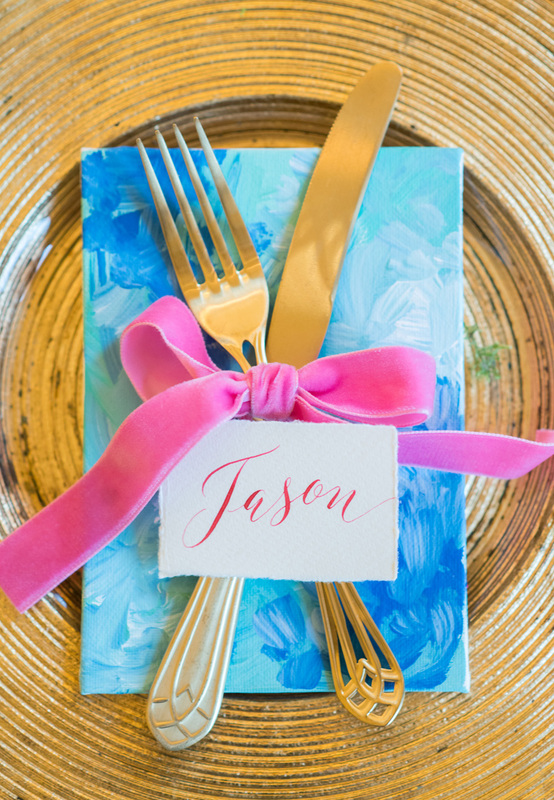 I was asked to create a sample calligraphy set using bright colours which would be really unique and eye-catching… and brush lettering was absolutely perfect for the occasion! 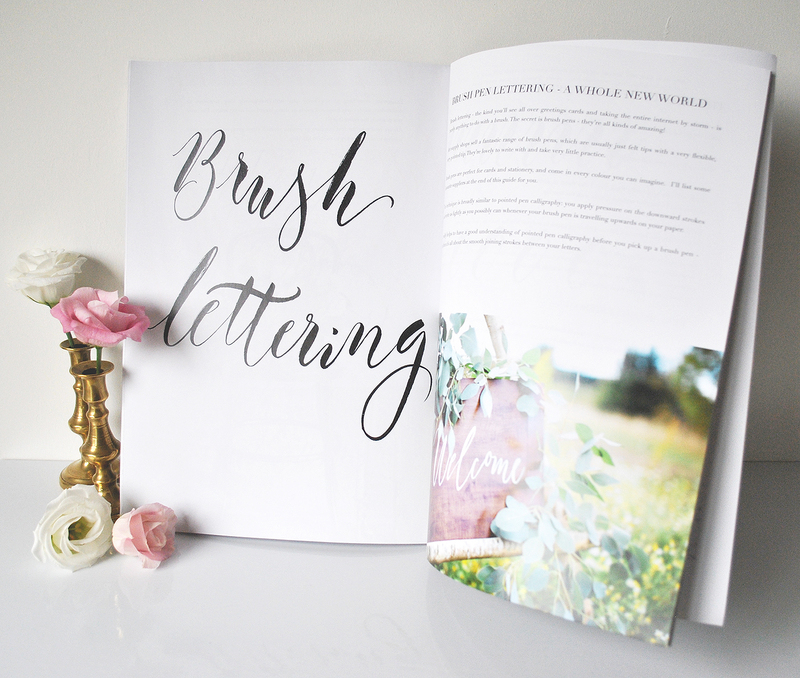 Learn brush lettering like this! The larger lettering is done with a brush pen, and I’ll be teaching this style at my brush lettering workshop in Manchester on the 18th of March. Do come along: we still have a few places left on the day (which runs from 1pm until 4pm and is in the wonderful Northern Quarter). The smaller lettering is written with a Nikko G nib, in gouache. 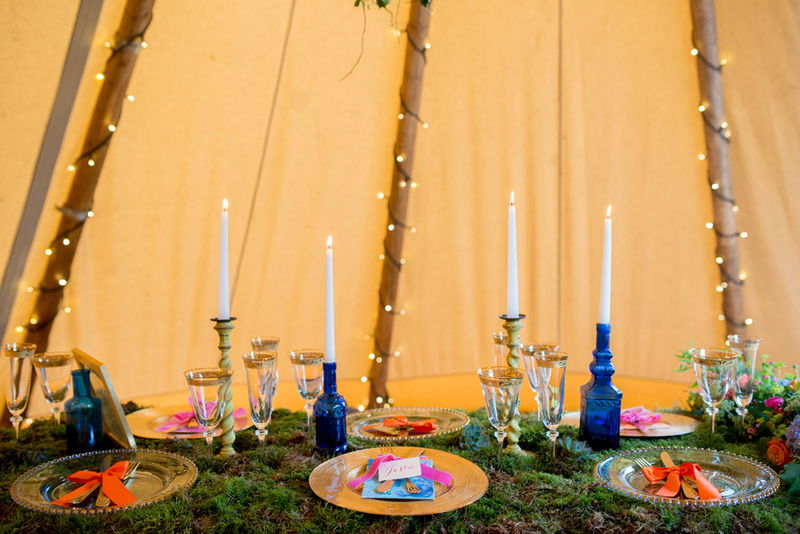 It’s a more delicate technique, but still a playful and casual style – perfect for a festival or tipi wedding, a summer celebration or a barn or outdoor reception. They say you should be a flamingo in a flock of pigeons. While I think pigeons are pretty cute, there’s something to be said for that flamingo… and I suspect any flamingo couple would choose colours for their wedding stationery. The most important thing? Don’t be shy: be YOU. Choose bright, and be bold! 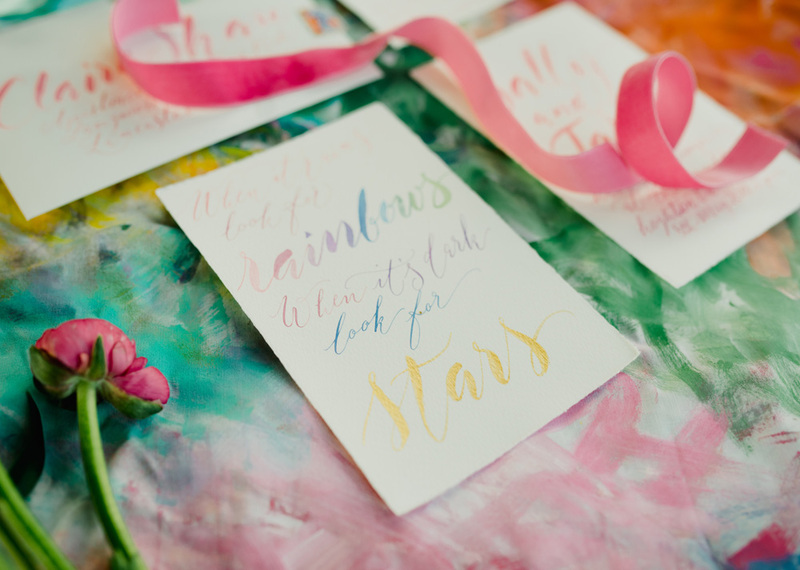 Sneak peek: brush calligraphy in a rainbow palette – and learn to write like this! 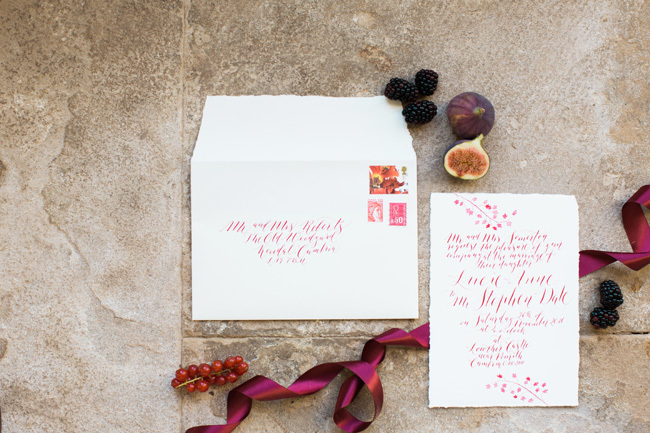 How would you like to learn to write wedding invitations just like these? Because I can teach you! There are still a handful of spots left at my brush lettering workshop in Manchester on Friday the 18th of March… and one of them could (literally!) have your name on. To book your place at the workshop click here – the link will take you to my Etsy shop where you can see full details of the workshop and buy online. I’ve been sharing brush lettering demos on my Instagram these last few days, and writing tons of examples for the workshop next Friday. 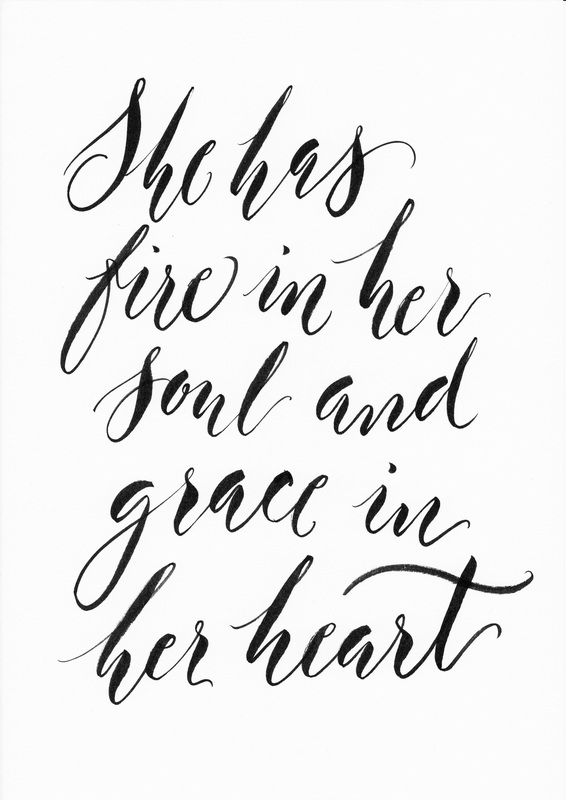 However you find your way around the brush lettering pens, I know we’ll have a super fun session and you’ll leave at the end of the day feeling inspired, excited to practice and keen to perfect your newfound brush lettering skills! 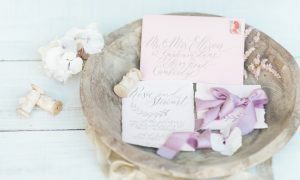 You’ll soon be able to write gorgeous envelopes and stationery pieces just like these, if you want to! 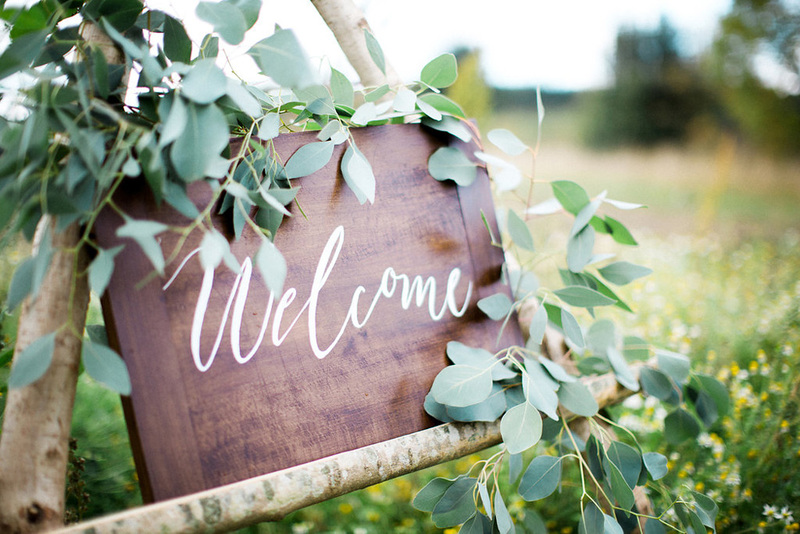 Huge thanks to lovely Lancashire wedding photographer Emma B Photography for taking such gorgeous images and allowing me to share them with you. 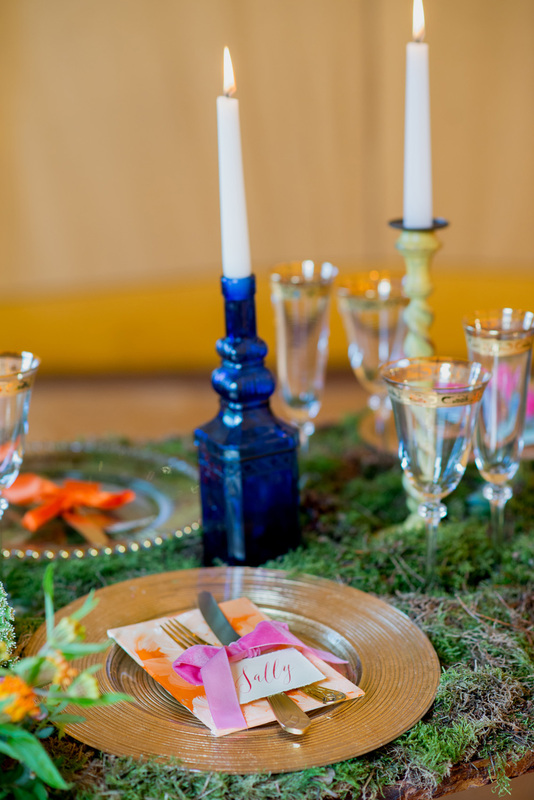 They’re from a rainbow coloured styled wedding shoot which I will share some more from very soon! 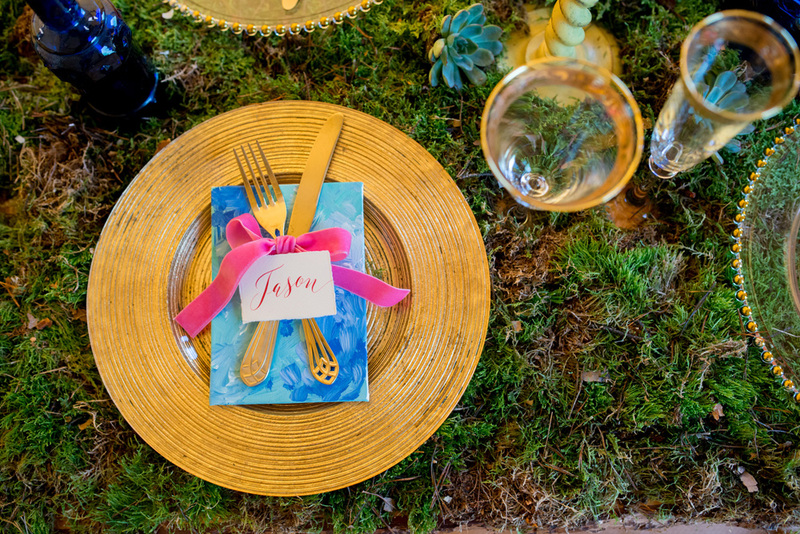 The place cards are vibrant and colourful, the table styling is out of this world. 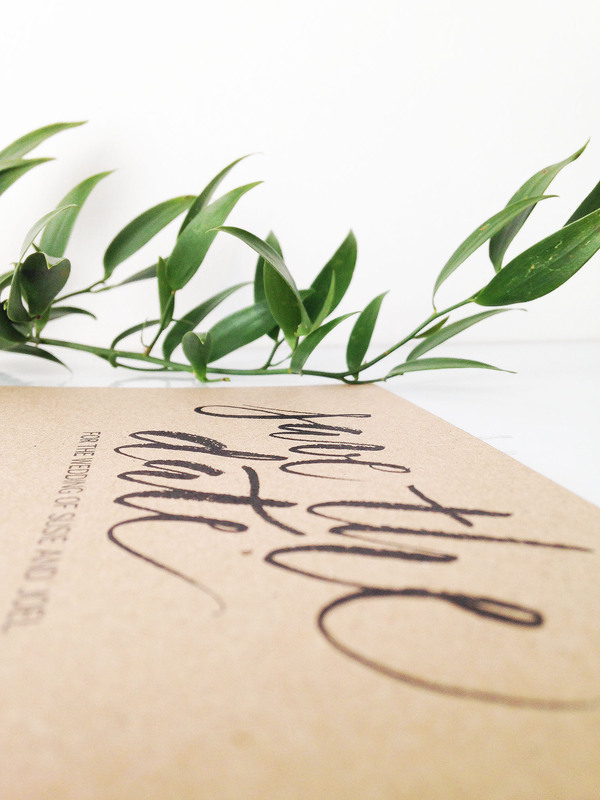 As I’ve been practising a little brush lettering ready for next Friday’s calligraphy workshop, I wanted to share an idea with you: if you’re learning calligraphy and want to incorporate it into your day, there’s plenty of choice of projects to inspire your creative fingers… but one of my favourites is designing your own invitations. I have a bit of a paper fetish… I think it’s acceptable; it comes with my work! 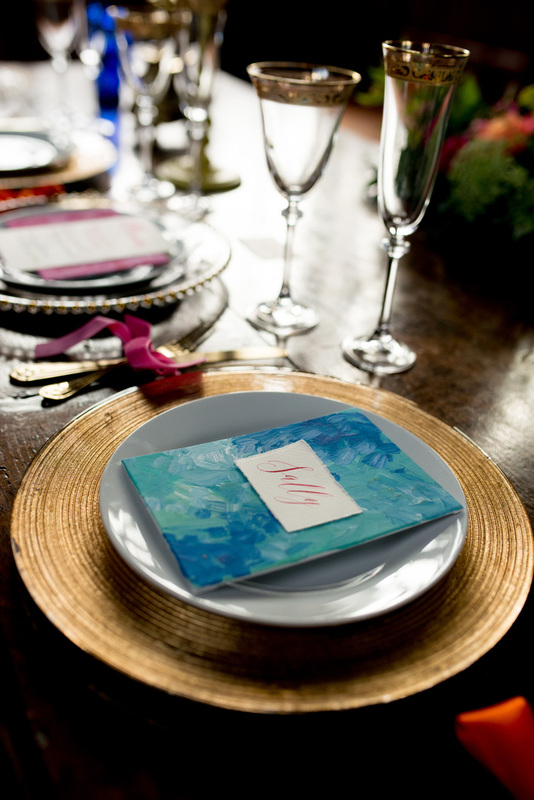 I adore designer invitations, I love crafts, and I have a lot of admiration for anyone who jumps in and designs their own invitations. 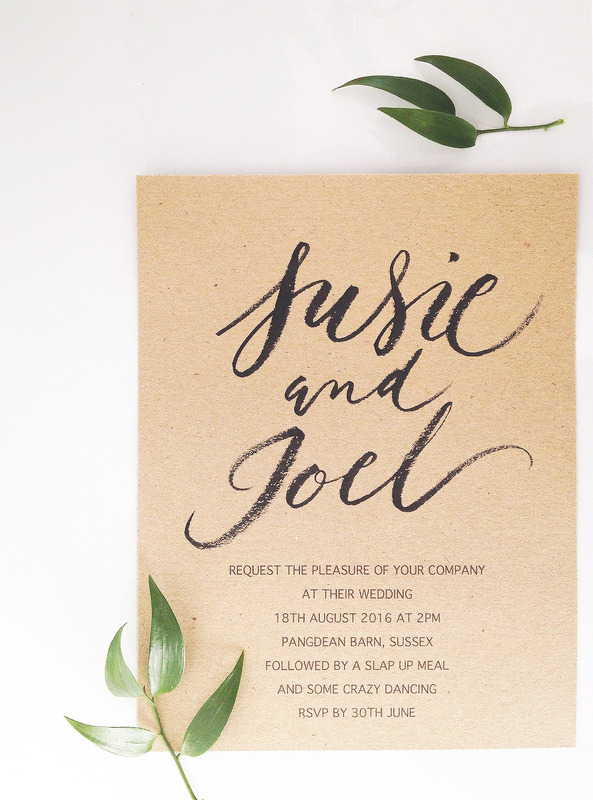 Incorporating your own style into the design of your wedding stationery will personalise those wonderful little details of the day, and possibly save you money as well. The trick? Keep it simple! These little invitations took me half an hour to make. They’re super simple… all you need is a computer with a word processing or design programme (Microsoft Word will do; I used Photoshop because I happened to have it open! ), a printer, card, a brush pen, and a guillotine. 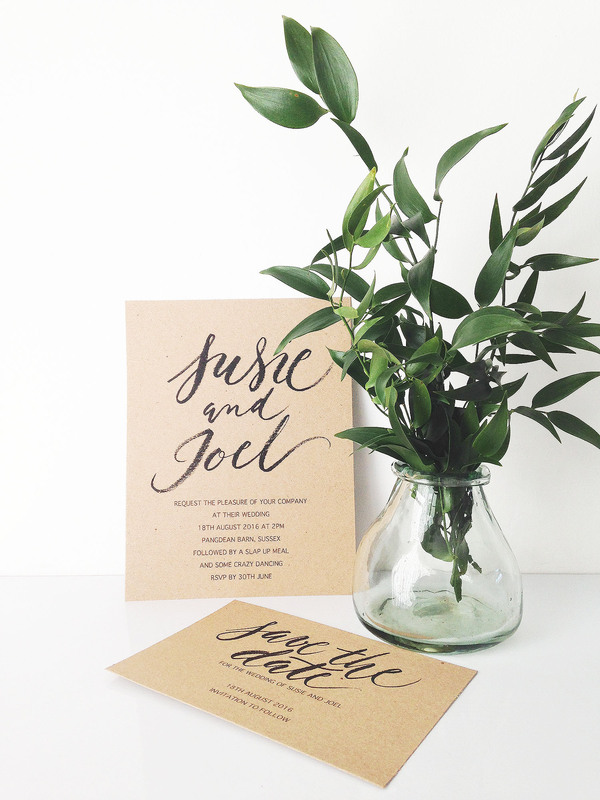 Printed lettering for your invitations and save the dates can be super simple. 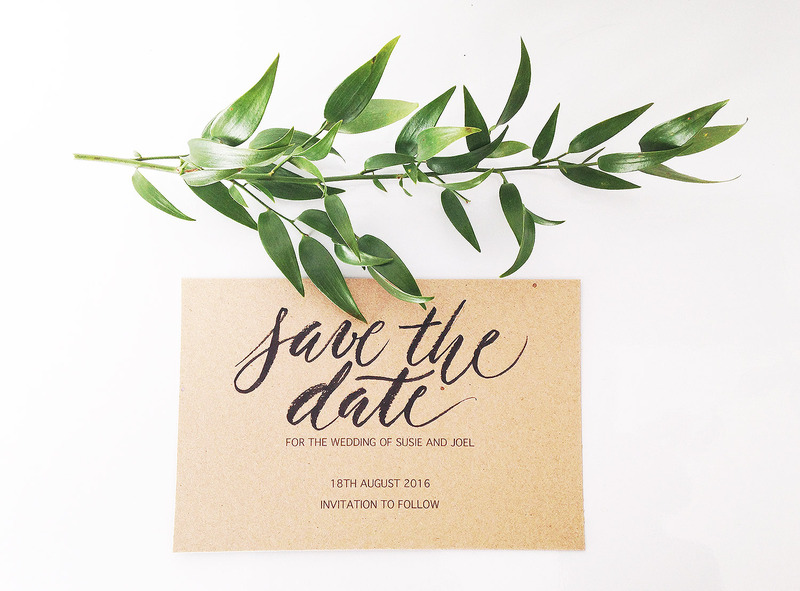 I quickly chose a sans serif font, typed up the main wording for my invitations and save the dates, aligned it centrally and printed as many copies as I needed onto A4 card. I trimmed the cards, leaving PLENTY of space at the top. This is key: calligraphy looks fab if it fills the page, but I think it looks better with a little empty space around… it adds elegance. Then I practised… first with a pencil to work out the layout for the calligraphy words and then with a Pentel Color brush to get used to how the pen would work on the cards. 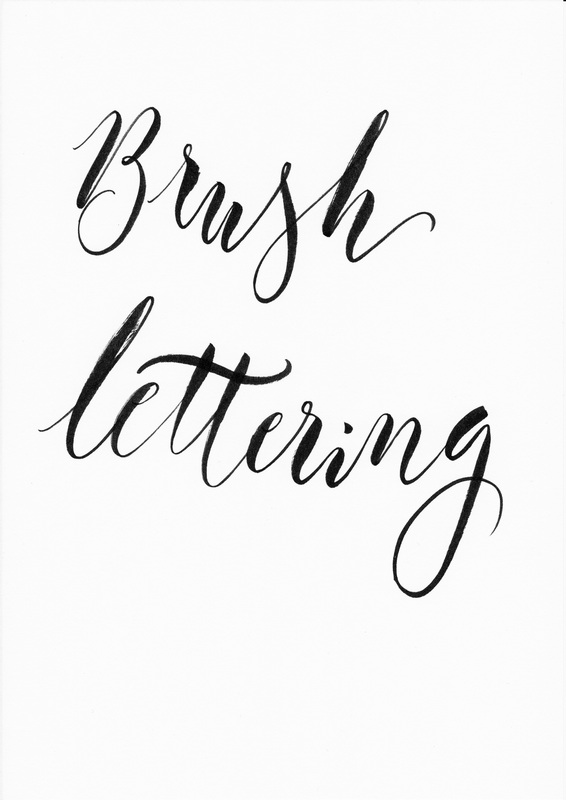 Kraft card has a wonderfully rough surface and so the brush pen lettering has a dry finish which I love – but you might find you prefer using a little more ink to get smoother letters. 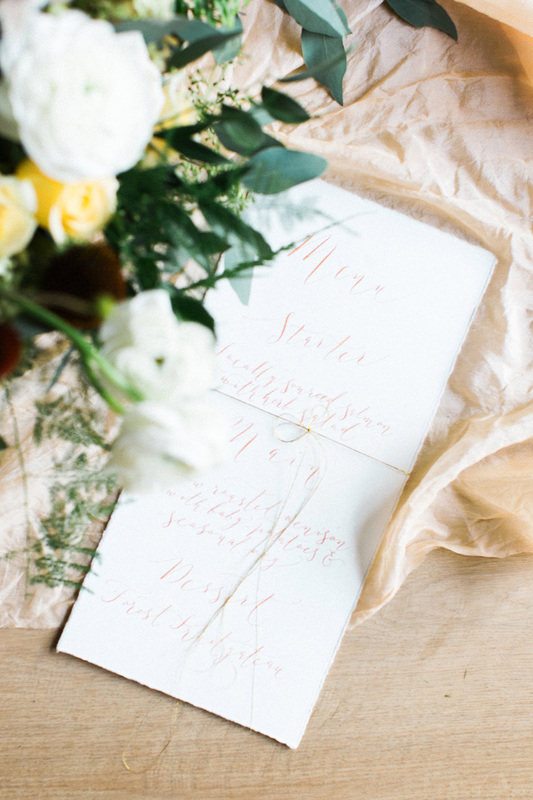 When you’re happy with your calligraphy – off you go with the invitations and save the dates. Have fun! 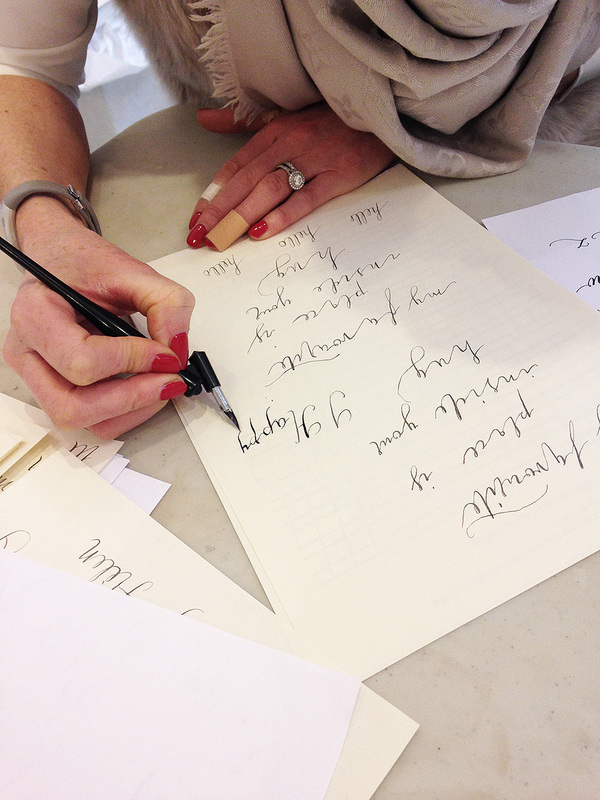 And remember – the beauty of handwritten calligraphy is that no one invitation is the same as another. There’ll be minor differences when your brush pen takes a flourish in an unexpected direction… but that’s creativity for you. 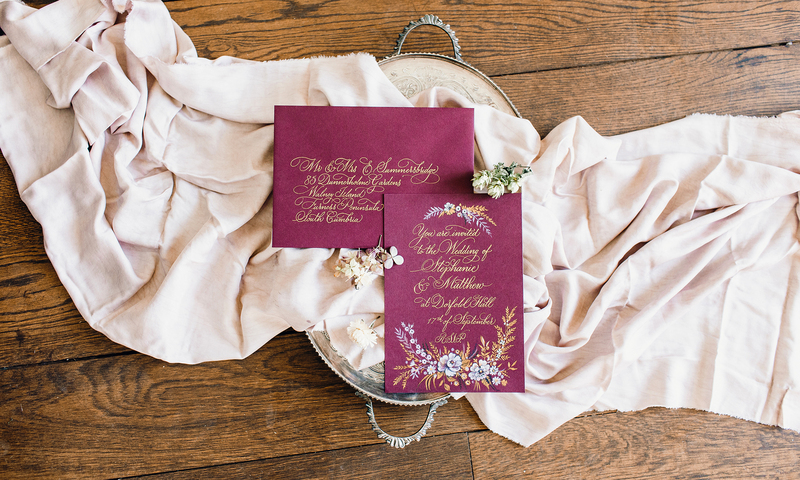 You’ll have a batch of wonderfully characterful, unique wedding invitations – and your guests will adore them! 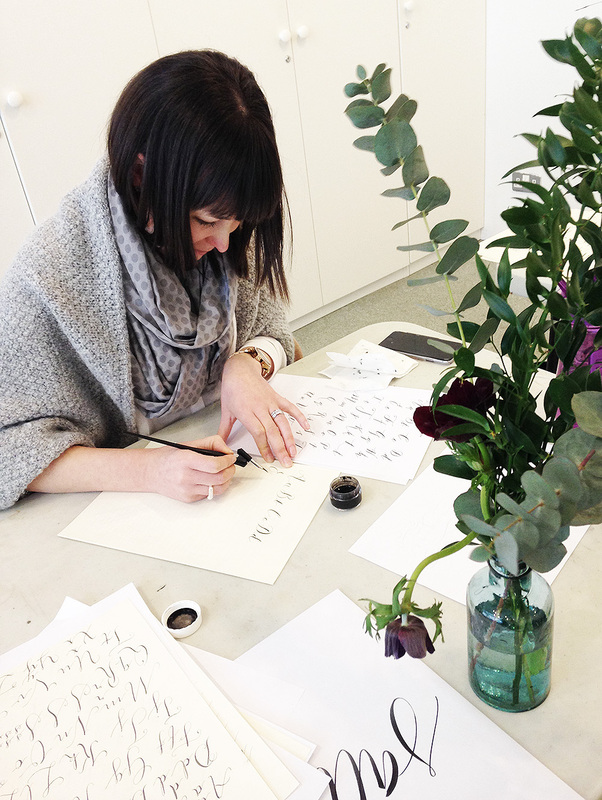 Would you like to join me for a brush lettering workshop in Manchester on Friday the 18th of March? 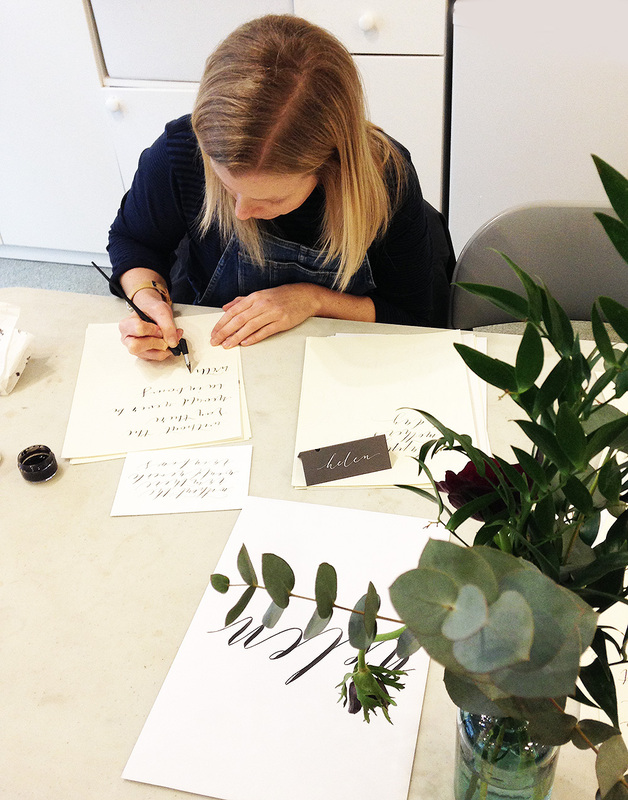 Book your place at the brush calligraphy workshop now! The next calligraphy workshop is going to be a little different – I’m going to be teaching the most popular calligraphy style for beginners, which is brush pen lettering. It’s so easy to get started: the brush pen technique is easier than writing with a metal nib and for this reason you see it everywhere on instagram etc. these days. 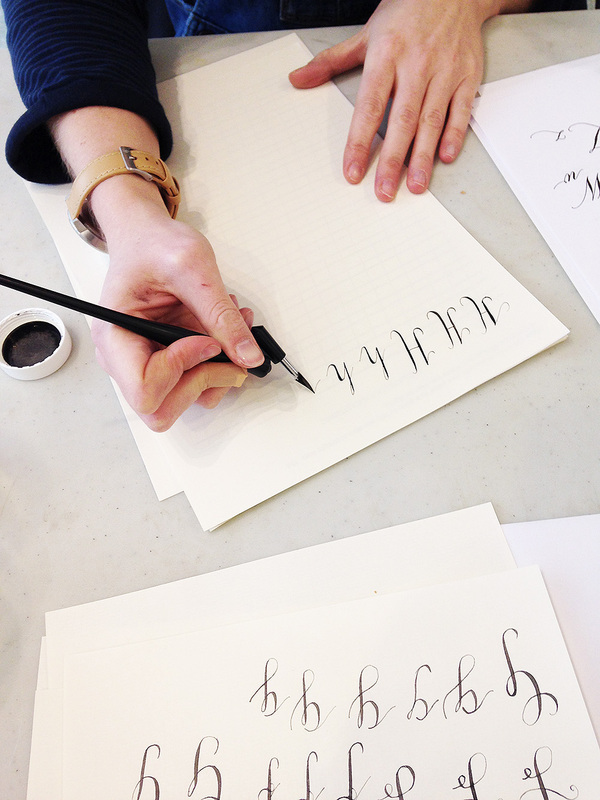 We’ll be learning the basics: how to hold and move a brush lettering pen, and how to shape letters in a pattern to form a pretty lettering style. 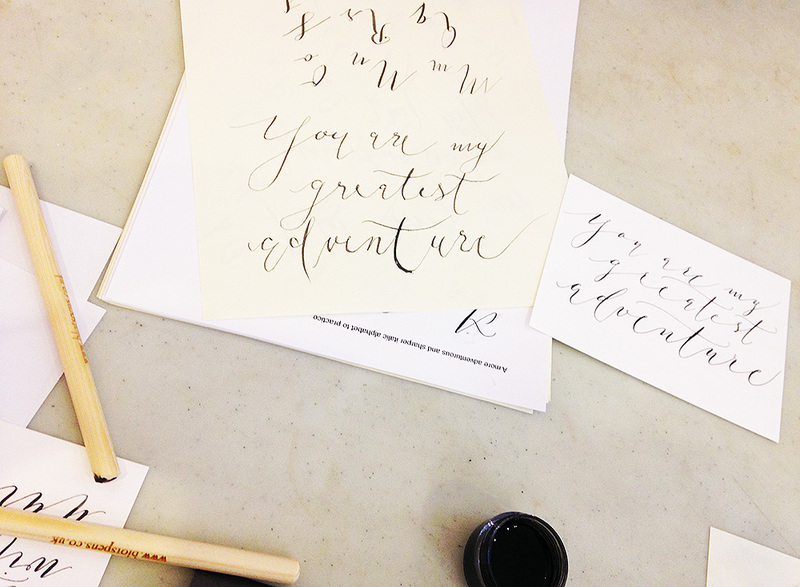 There are many different brush calligraphy styles so you will learn a couple of these on the day. We’ll also experiment with different pens: a basic brush pen to begin with, and then my favourite: the Pentel colour brush is all kinds of fun to write with! The workshop will start at 1pm and end at 4pm in Space 2 at the Manchester Craft & Design centre. You get to take home your brush pens, alphabet samples and instructions and I am confident every student to have learned all of the tricks and tips you’ll need to write a pretty brush pen alphabet by the end of the day. Booking online is easy: simply pay for your place in my Etsy shop. I should really blog to remind myself what I’ve done so I can look back at the year and see what I’ve achieved, rather than coming to write a post like this and knowing I’ll make some things up… or forget, or get dates wrong. So here, a half-remembered calligraphy journal and review of the year just passed. Last year’s resolution was to ‘do more shoots’ and it worked. I shipped samples all over the UK and now have some amazing images of my work to show for it. I realised I love shoots. They’re challenging creatively, the wait for images is exciting and even when I can’t be there on the day it’s great to network with other creatives. I have met some fab photographers and stylists along the way, people who I find inspiring and will be happy to work with again. 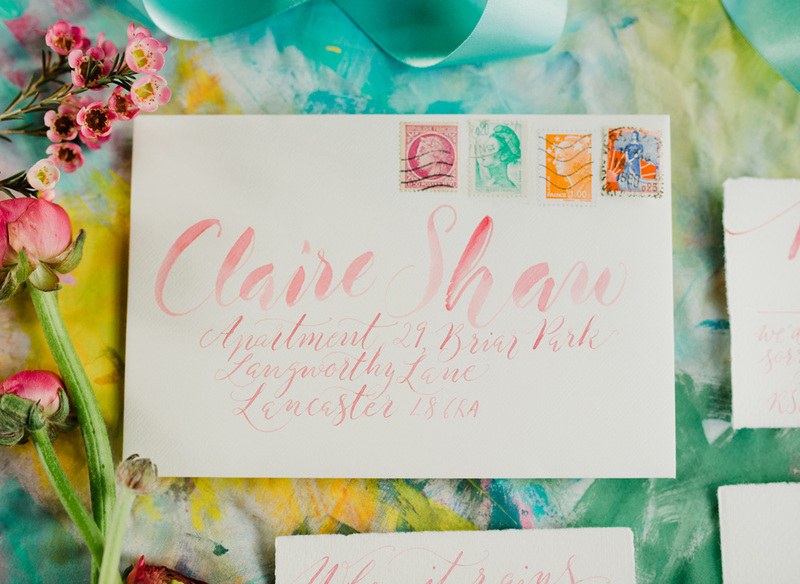 When I wasn’t creating new designs for shoots, my day to day calligraphy work carried on much as it always has with envelope addressing, naming invitations and a scattering of bespoke commissions from early in the year. A notable addition was my Not on the High Street shop, which brought in extra pocket money at the beginning of the year especially. 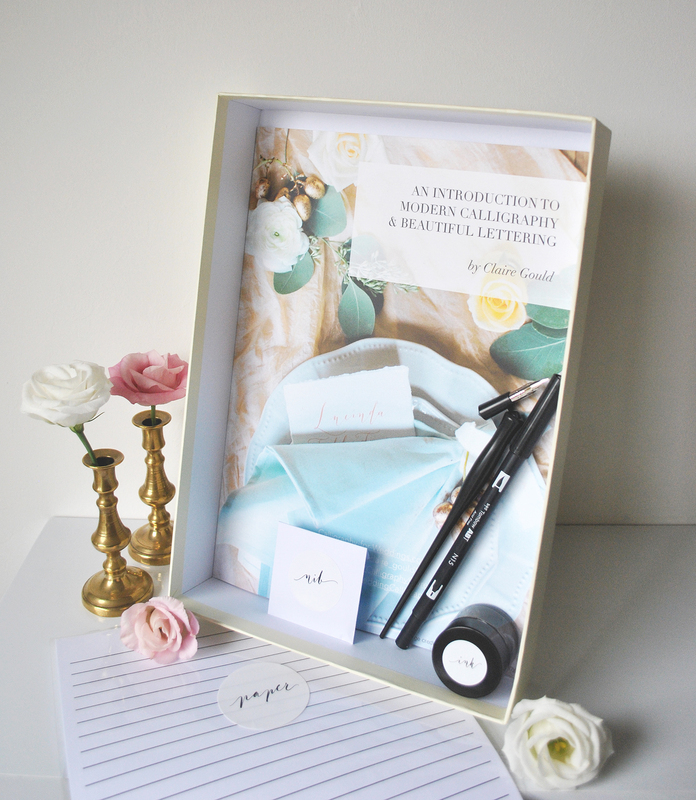 The top selling item there was – until November – ‘Will you be my bridesmaid‘ cards. I tried calligraphy kits and pens, one poem print and some wedding stationery: very much testing the waters for NOTHS so far. Their T&Cs are very strict so I didn’t want to overcommit especially in summer. In the end this wasn’t a worry so I will look to sell more via their website in 2016. Over the summer I got involved in some larger scale and creative lettering, particularly with the team at Aspire Photography Training as well as on shoots for Melissa Beattie and Ashley Edwards. Some was tons of fun to do; it was all a learning curve. I find writing on muslin very difficult and won’t volunteer to do it again! At Aspire I wrote on chalkboards for a shoot later in the year. 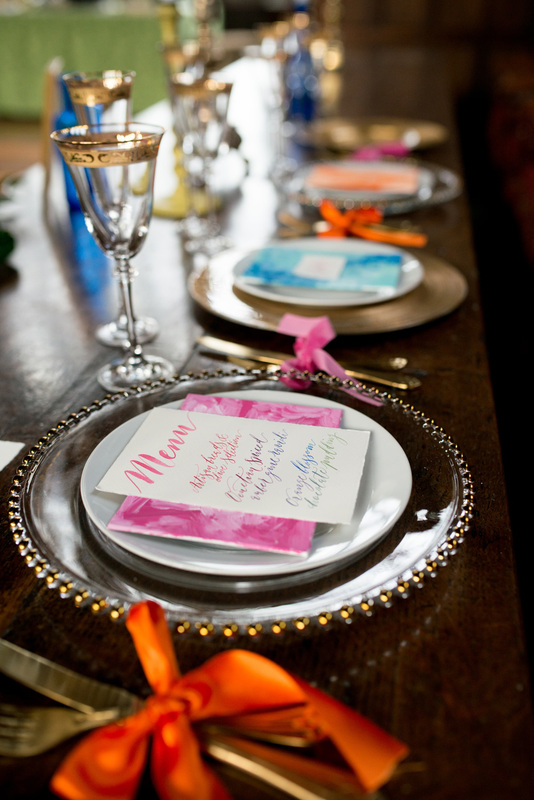 That was fab – the trick is window markers rather than chalk or pens. The results are in the English Wedding Book. 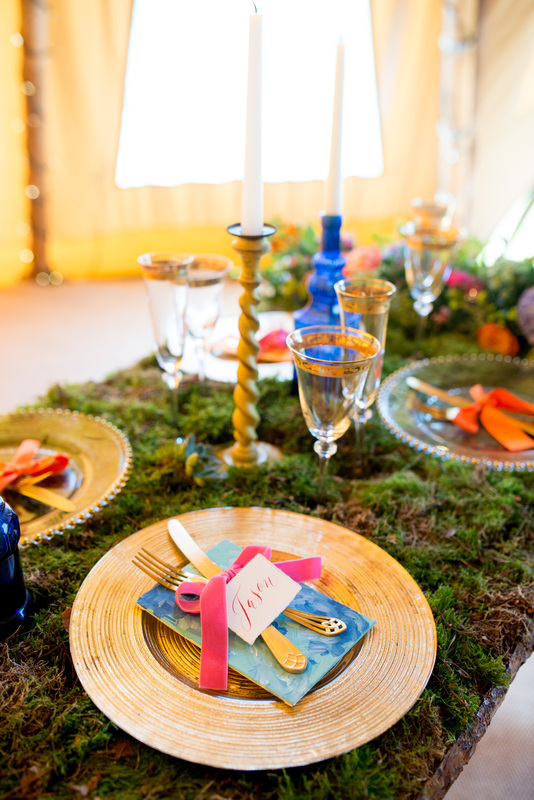 Mirror writing was another hit in 2015 for real weddings. 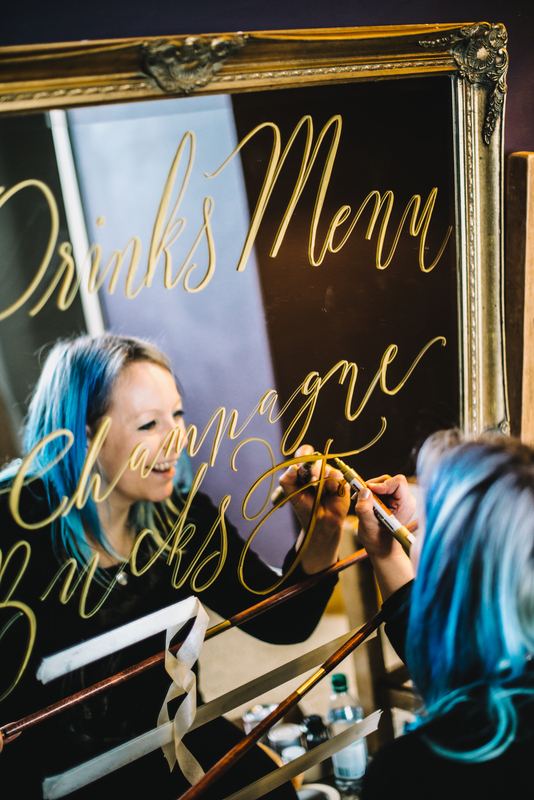 It’s a treat to write on mirrors and glass – they’re so smooth and the pen glides along glass so beautifully. But it takes very careful planning and a long time measuring up: my secret is dots of white marker to show measured spacing and masking tape instead of ruled lines. The logistics of mirror calligraphy are fun too (as UK courier companies won’t deliver mirrors without a huge fee) – one lovely customer came to meet me in a car park near the motorway; another collected their mirror from a Manchester calligraphy workshop; lovely Emma Tebbey collected an enormous Laura Ashley mirror table plan from my apartment. Emma has been another highlight of my year. Her vision leads to some amazing creative projects. She asked me to write on pieces of slate for Askham Hall‘s brochure so I wrote a menu on a surprisingly huge chunk of slate as well as place names on smaller pieces. 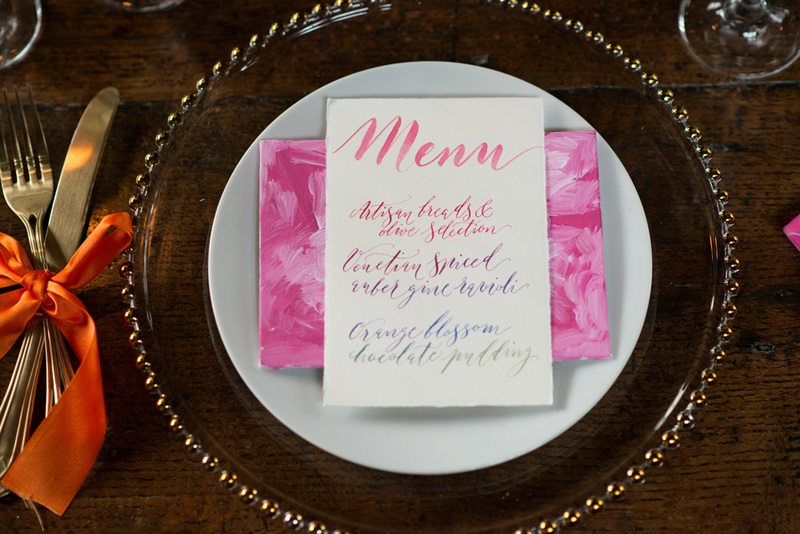 I also did some gold ink calligraphy – using my new Finetec palette – on navy card for a shoot with Taylor & Porter in Cornwall, which Emma styled. 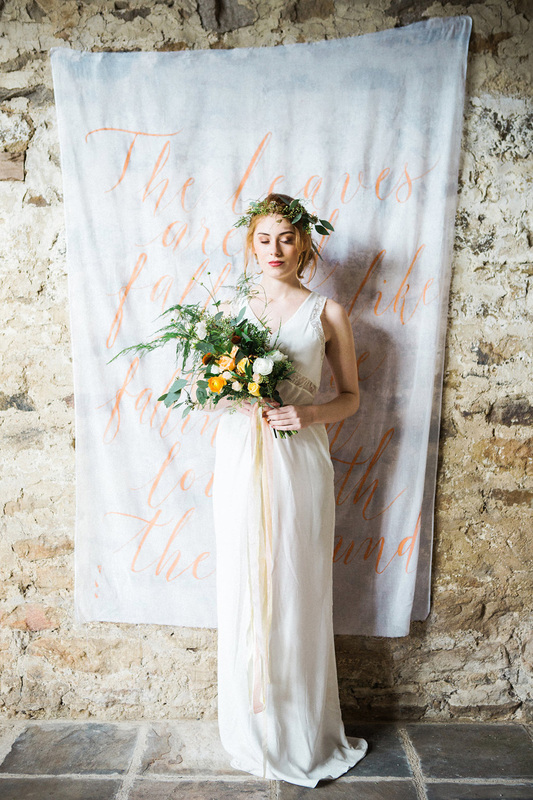 The shoots mentioned above have led to some amazing coverage in top wedding blogs: Wedding Sparrow, Magnolia Rouge, Junebug, Love My Dress, Grey Likes Weddings and Style Me Pretty. 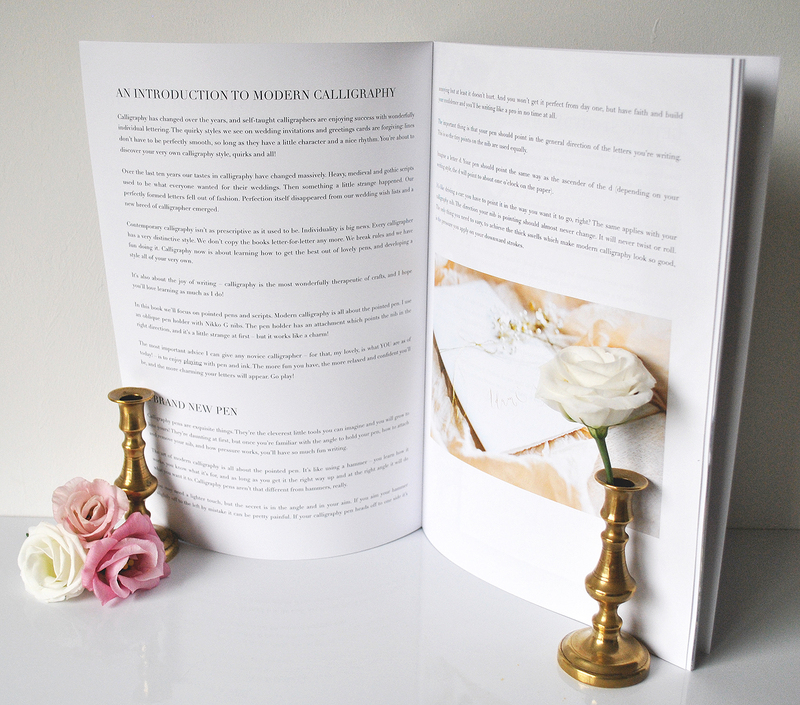 I really need to add a ‘press’ page to my website! In early summer I signed up to teach at The Handmade Fair again. 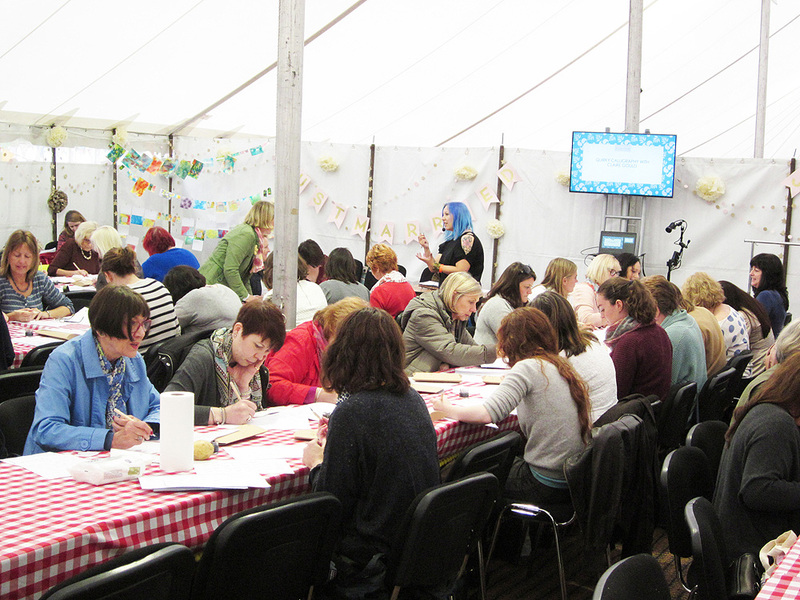 The plan was as last time: midday workshops teaching the very basics of lettering to 100 people at a time. We refined our kits to make setting up more streamlined. 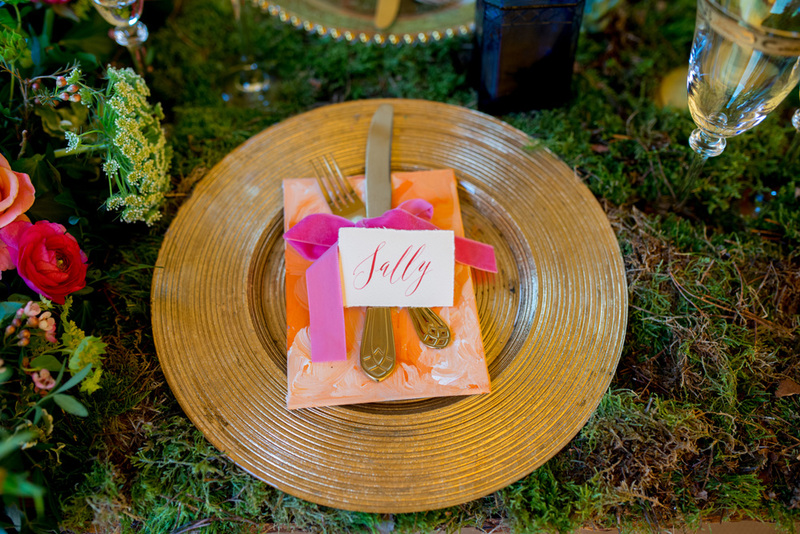 I was on the TV ad – which was hilarious – and before the event I had some calligraphy projects featured on Whimsical Wonderland Weddings and The Handmade Fair’s own blog. 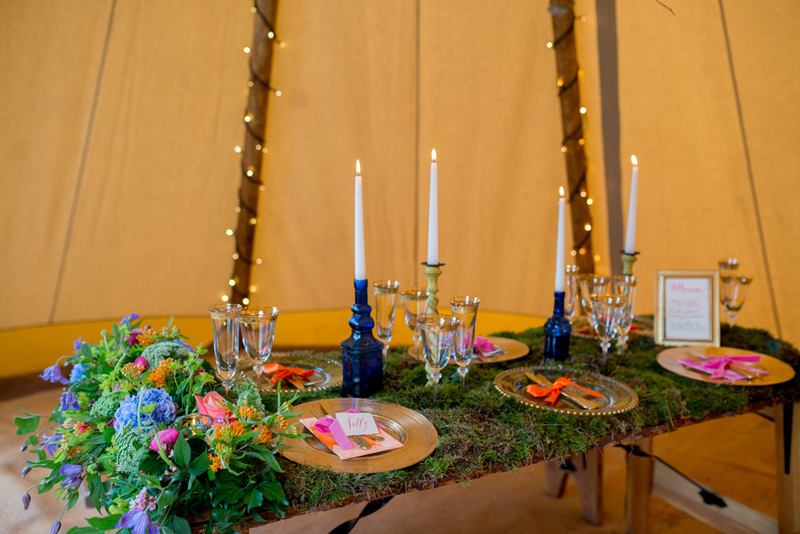 The show was a whirlwind; our workshops were one of the best-selling in the wedding tent, we even met Kirstie Allsopp very briefly as she swept through the green room on her way to the big top for a show. Teaching at The Handmade Fair is very rushed. It’s loads of fun – but I don’t think you can really teach enough in such a short time period. 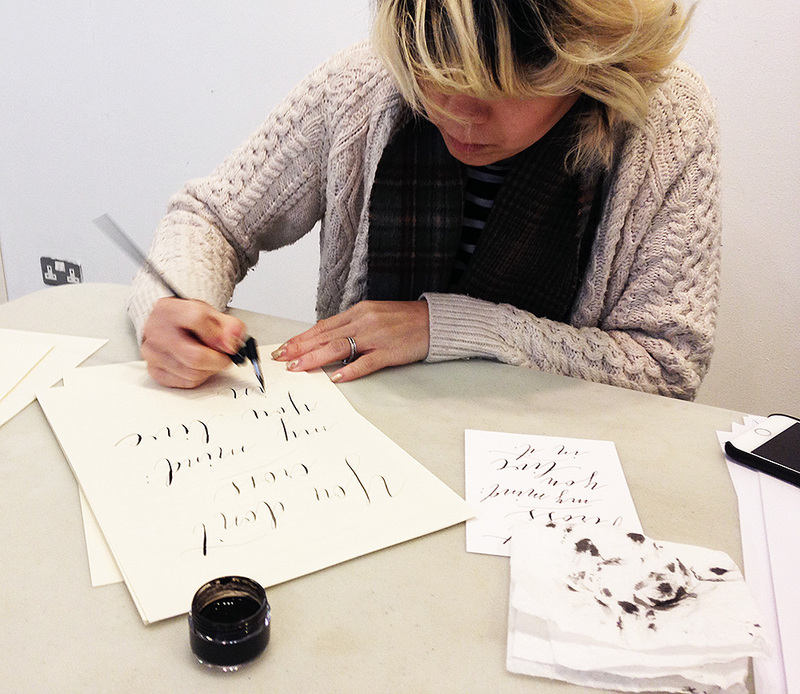 I’ll happily hand over the gig to another calligrapher next year. I prefer teaching workshops in smaller groups now, and my Manchester workshops have been fantastic. The first, in August, was a trial run for The Handmade Fair but went so well I held workshops in October, December and January, and there are monthly workshops planned for 2016. A final highlight to 2015 – and a great way to end the year on a high – came from my first workshop in August. 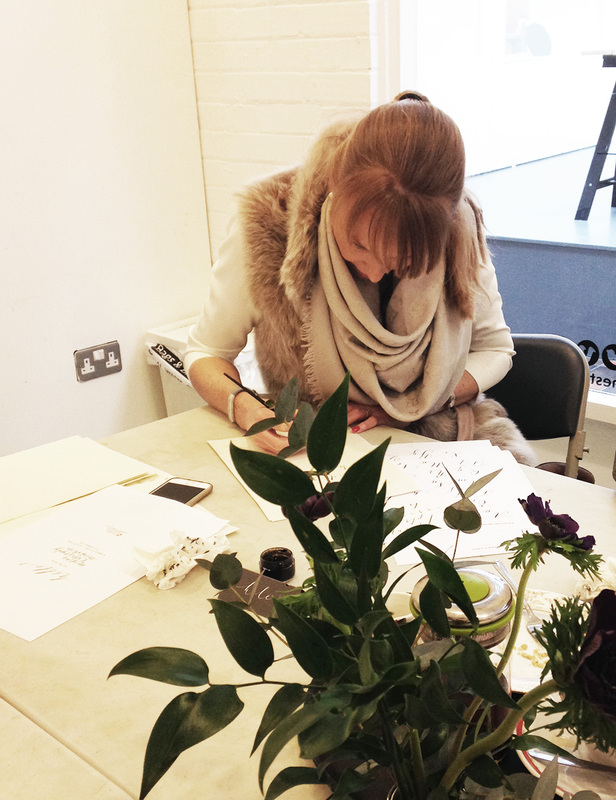 Illustrator and cake designer Amy Swann came to the very first workshop and brought along some floral illustrations which blew me away! 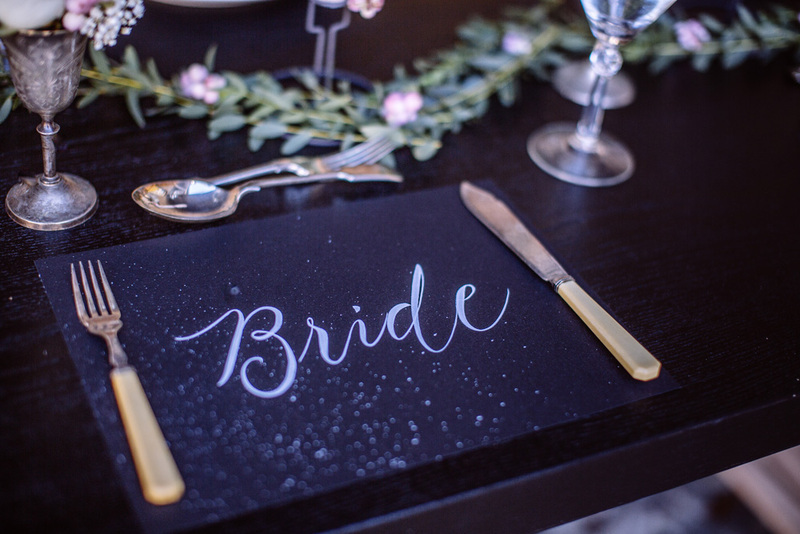 She asked me to write a calligraphy logo for her, which I did, and we then worked together on a series of styled wedding shoots and got to know each other’s work well. 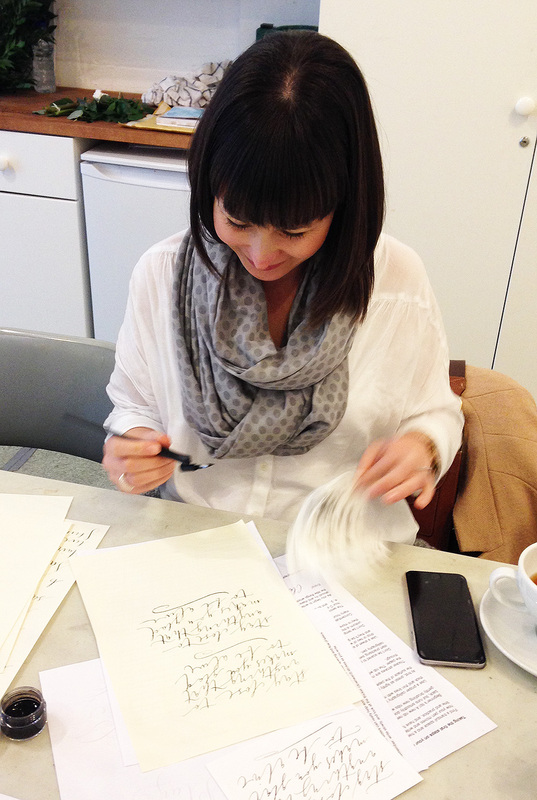 So in November Amy & I hatched a plan to design some cards and prints to sell for Christmas. 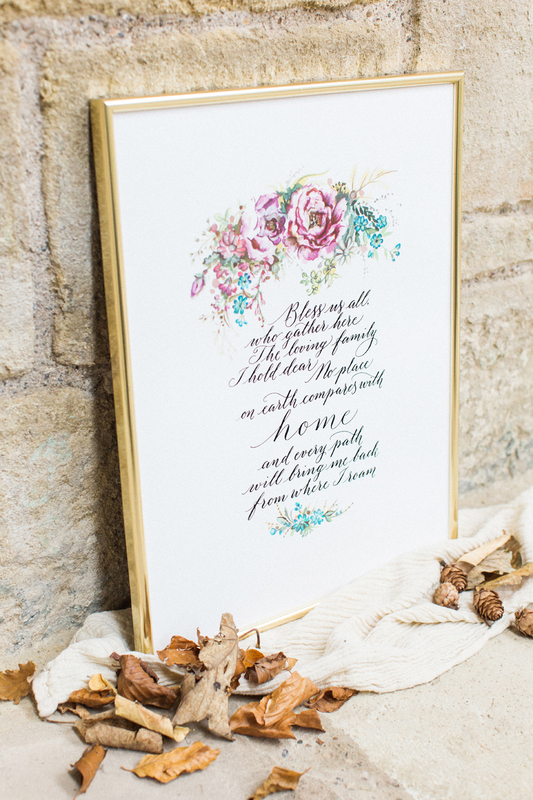 Amy illustrated floral wreaths and borders, and I added calligraphy and arranged for everything to be professionally printed. 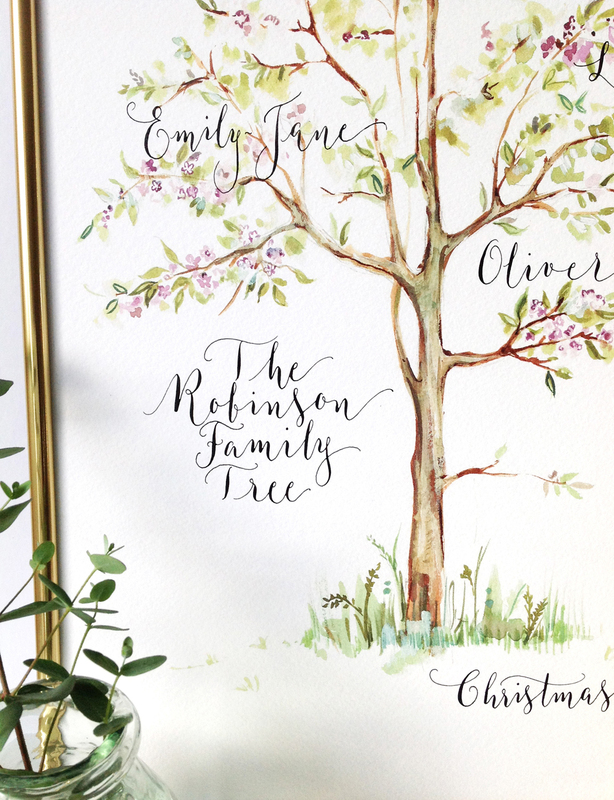 We sold a few of everything, and most are still available on Etsy – but the main hit was our calligraphy family tree. This flew off the shelves at Not on the High Street as a Christmas gift and is still on sale now. keeping a record of what I do so I can blog about it next year! 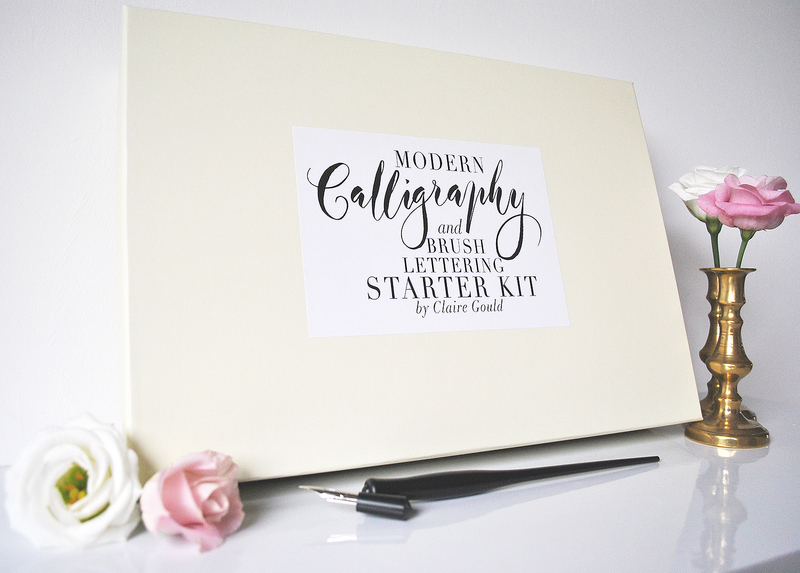 New calligraphy starter kit with book! 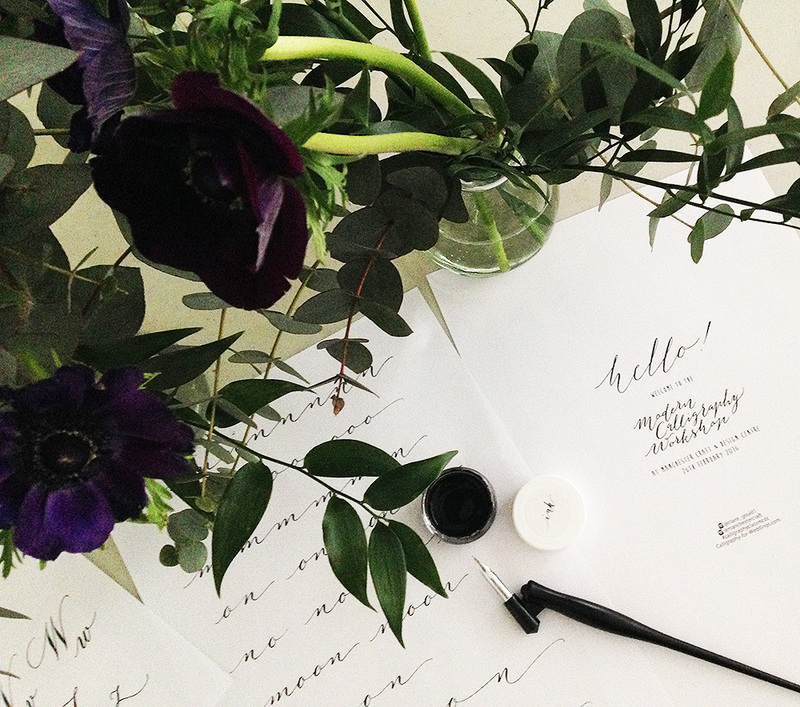 Learning calligraphy has never been so easily accessible. 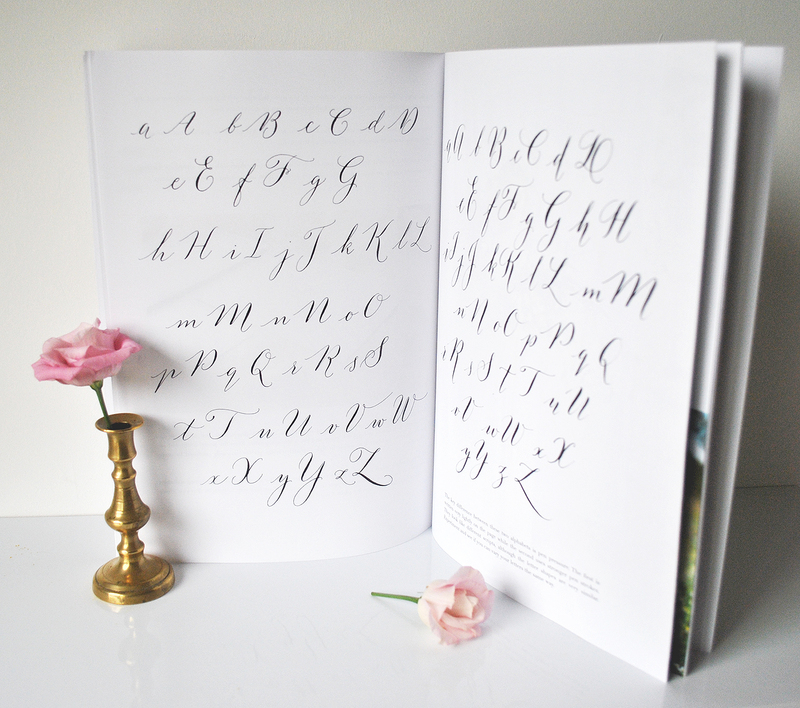 Through my workshops at The Handmade Fair and in teaching at Manchester Craft & Design Centre I’ve learned just how quickly some of you take to beautiful lettering – and you’ve inspired me to update my calligraphy starter kit with a new version for 2016. 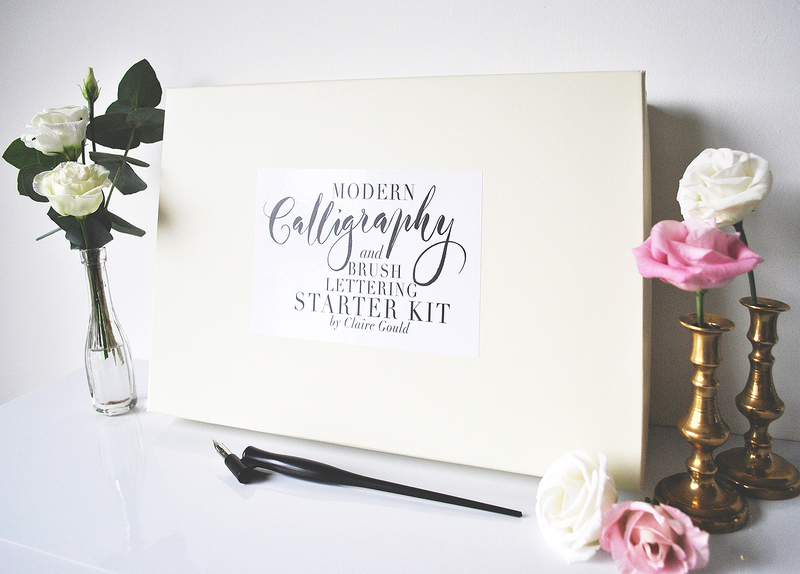 This calligraphy kit has EVERYTHING you’ll need to get started. We think it’s the best you can buy. 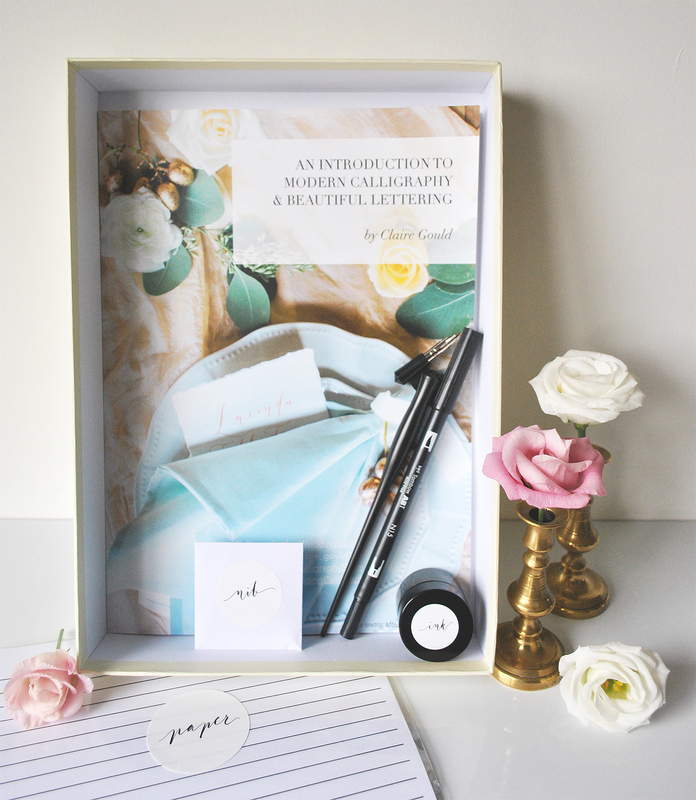 Order your calligraphy starter kit today and you will receive a dip pen, brush lettering pen, jar of ink, paper, gridlines and 36 page instruction book. 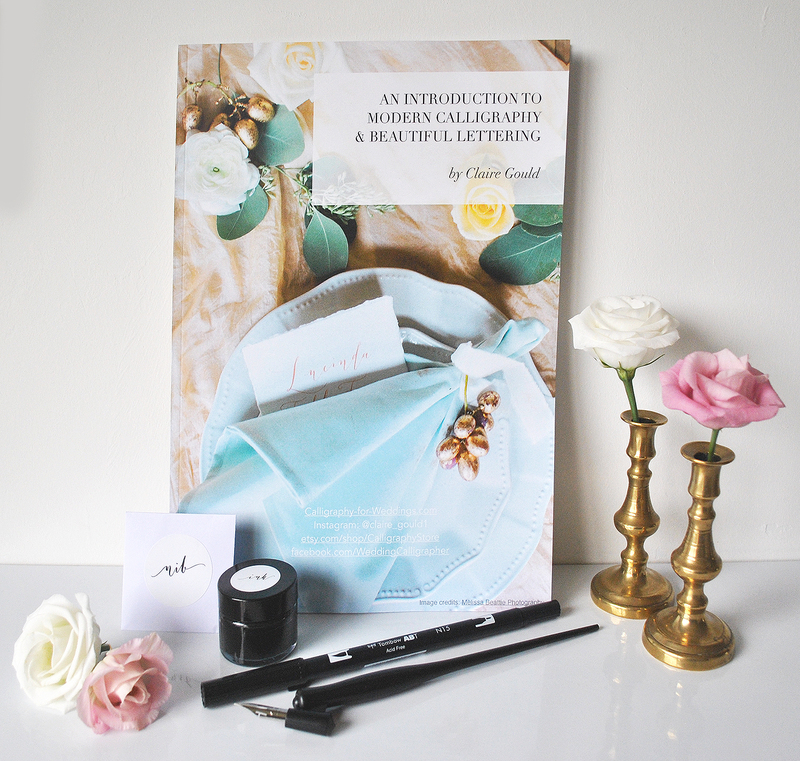 The book is the pièce de résistance of the calligraphy kit: with 36 pages of step by step instructions, guides, letters and alphabets alongside beautifully styled calligraphy photos it will make learning your new craft a glorious journey. 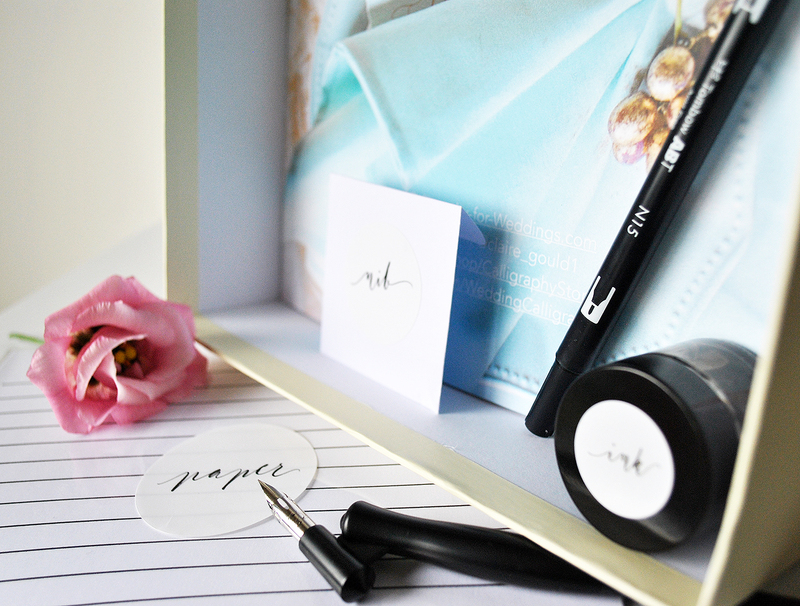 Many calligraphy kits on the market only include a dip pen and metal nib with some examples and alphabets. 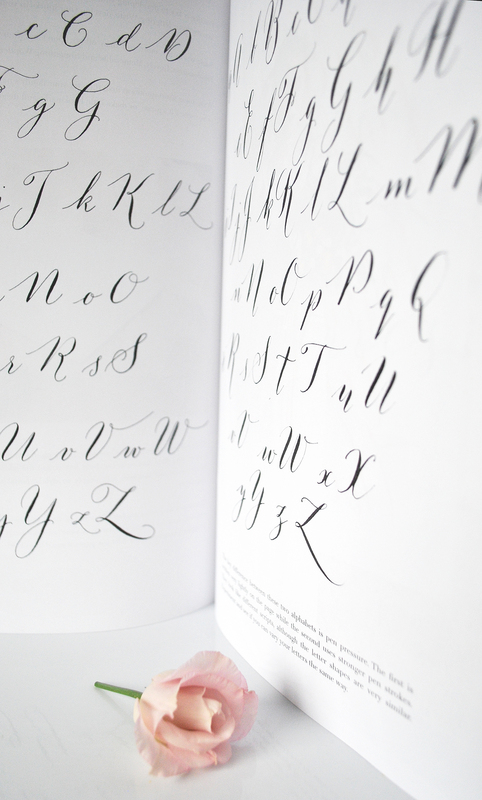 Others – the cheaper versions – only include a brush lettering pen and a booklet. Ours gives you both, with a colour printed book and guidelines to follow. Experimenting with modern lettering and playing with brush pens are both so much fun – so explore both! 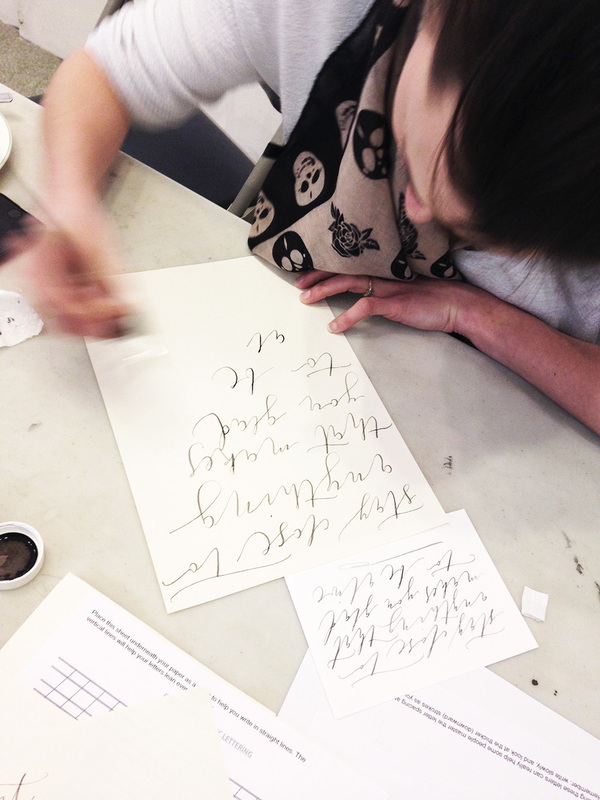 Calligraphy workshops in Manchester: see our new film from the classroom! 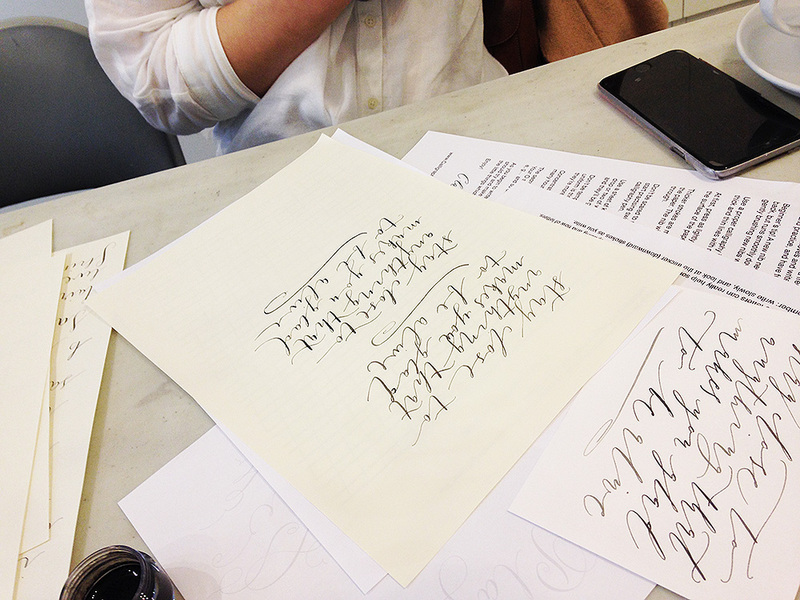 Friday the 15th of January was our first calligraphy workshop at Manchester Craft & Design Centre. 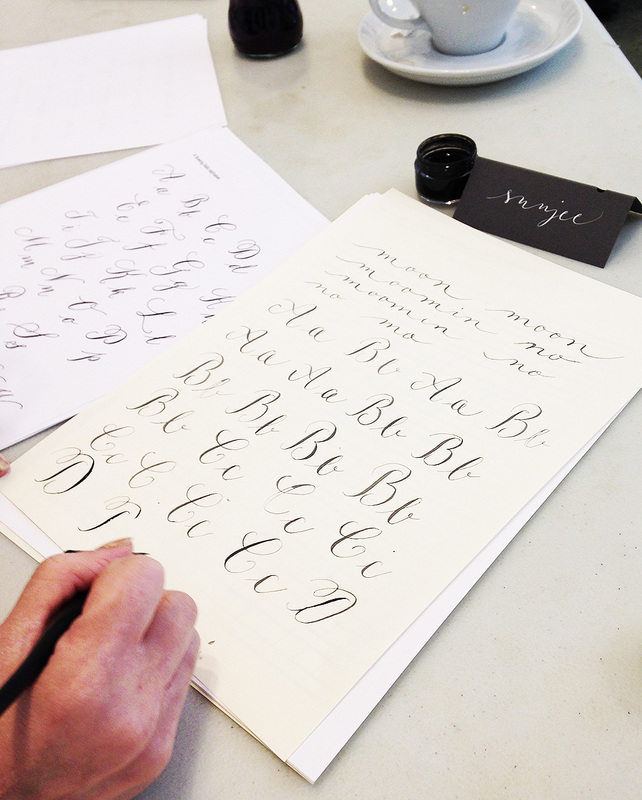 13 lovely students came along, and we learned – as we always do – how to get to grips with a dip pen and pointed nib, working our way through some simple exercises and learning a basic calligraphy alphabet. For the first time ever, the day was captured on film by lovely Paul Kyte Wedding Photography for the pkprophoto.uk blog. It was a great day – I remember lots of giggles and as everyone mastered their pens it was just fantastic to see all of your different lettering styles emerge. Huge thanks to everyone who came along: Fiona (thanks for the interview! ), Kay, Emma and Jessie; Sue and Emma, Amy and Kerry, Vanessa and Gemma, Louise and Nicki – you were fabulous. Oh, and you’re film stars! I can thoroughly recommend Paul Kyte to any wedding business owners who are looking to collaborate on a ‘how to’ style film to use online; and especially to brides and grooms looking for really good photography and an unobtrusive, super friendly photographer with something different to offer! Check out the pkprophoto.uk blog for more info.